In Libya, The Truth Is Often Tough To Pin Down Moammar Gadhafi's regime is using all its weapons — guns, tanks and propaganda — to prevent a nationwide movement for change. 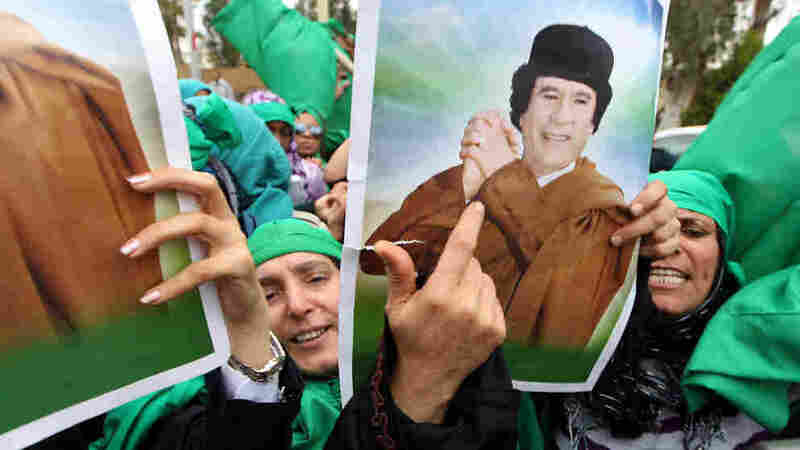 But there are signs Gadhafi's grip on the capital could be loosening. NPR's David Greene has spent the past month covering the conflict. As he prepares to leave Libya, he has a few reflections. The uprising in Libya has become something very different than what took place in neighboring Egypt and Tunisia. Moammar Gadhafi's regime is using all its weapons — guns, tanks and propaganda — so far preventing a nationwide movement for change. NPR's David Greene has spent the past month covering the conflict. As he prepares to leave Libya, he has a few reflections. I began my reporting four weeks ago, trying to hear from Libyans — any Libyans — about what was happening in their country. Along the Tunisian-Libyan border, it felt like being in the arrivals hall of an airport, watching one traveler after another emerge from Libya. I didn't know exactly who I was waiting for. Anyone with a story. One man, whose name we're withholding for his safety, told us about where he lives in Libya, a place called Nalout. At the time, he said the city was behind the rebels. But no one could go on the streets to protest anymore, he said. Gadhafi's military had shown they would use violence to empty the streets. We got a different story from another man who drove across. He said everyone loves Gadhafi. "What we want in life is to be comfortable, to be safe," he said. "And that's what [Gadhafi] offers." You'll notice how the truth in Libya is tough to pin down. I found the same thing once I got to the capital, Tripoli. A school I recently visited was closed last month when protests broke out in the capital. When kids returned, they were back to singing their pro-government anthem. I asked the teacher what she told them about why school was closed. Nothing, she said. Everything is fine here. And that's the message, 24 hours a day on state television, where all you see is green flags waving and a lot of cheering. For Libyans who watch CNN or Al-Jazeera, the government tells them that's all lies. It says so on billboards around Tripoli, written in Arabic: "Brother citizens, be careful of the news. Lies and rumors are misleading." The government wants Tripoli to seem like a place full of people who revere Gadhafi. It's not about making that impression on the West — it's about getting this message to stick in the capital. 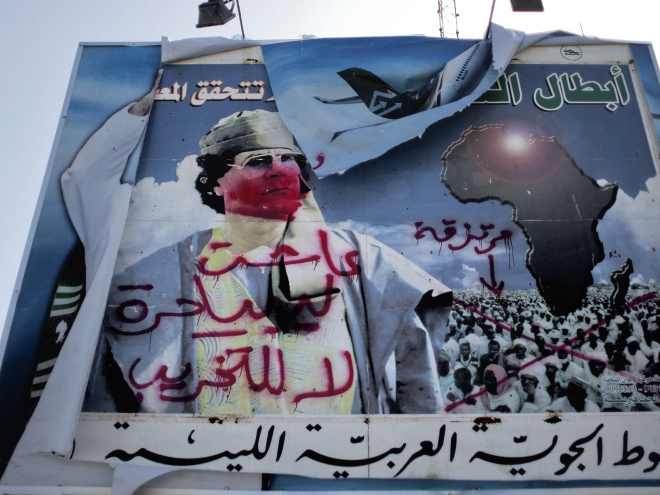 But there are signs that Gadhafi's grip on the capital could be loosening. At a recent funeral, the government's message seemed to backfire. On one hand, angry men fired bullets into the air. They'd come to remember civilians who, we were told, had been killed in airstrikes. A vandalized billboard of Gadhafi stands outside the airport of the eastern city of Benghazi. But I met a man at the funeral who discreetly chatted with a few journalists. He whispered as men with guns stared him down. Many people in Tripoli, he said, don't believe airstrikes are killing civilians. He insisted the funeral we were witnessing was a hoax. Again, it's hard to pin down the truth. But the government's response to questions about that funeral were curious. A Gadhafi spokesman, Ibrahim Moussa, tried to explain why there were no coffins and no bodies. "You know, someone, some official stupidly thought he can do it," he said. "But people completely rejected it because people are tribes, and each of them want their kid or their girl or mother or father to be buried next to the family cemetery. And that's why the whole thing failed." That may or may not be the Gadhafi government beginning to unravel in the face of enormous pressure and relentless airstrikes. The bombs and missiles falling all week here in Tripoli have opened a new chapter in this story. As I leave Libya, I think of the cheering crowds who remain steadfast in their support for Gadhafi. And voices like this, the man I met at the funeral. I called him back recently. He finds hope in what Western powers are doing to weaken Gadhafi. "I thank them very much. I want them to carry on," he said. "Really, that's what I want. I want them to carry on nonstop, 'cause Libyan people, they need help."